You hear these rumors and wonder if it’s true. Progress has its place, but I heard that the Belmont underpass is going to be taken out for the expansion of the tracks and line for the Union railroad’s High Speed Rail corridor. Another business owner had told me about his having to move from his location south of Fresno, in the area of Van Ness and Railroad. And it was in the Fresno Bee about the Olive Avenue and Weber proposed new overpass construction. East side rail, looking toward Roading Park. West side rail SP logo closeup – from pedestrian walkway. 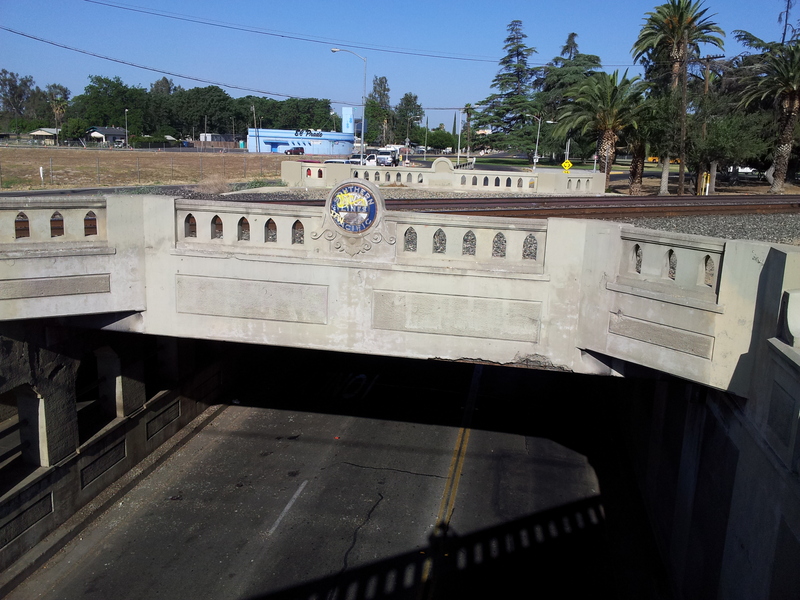 If the Belmont underpass was in the Bee, sometime back, I missed it. It was appalling enough to notice several months [years?] ago, that the beautiful enameled, or ceramic, Southern Pacific logo spray painted with graffiti. 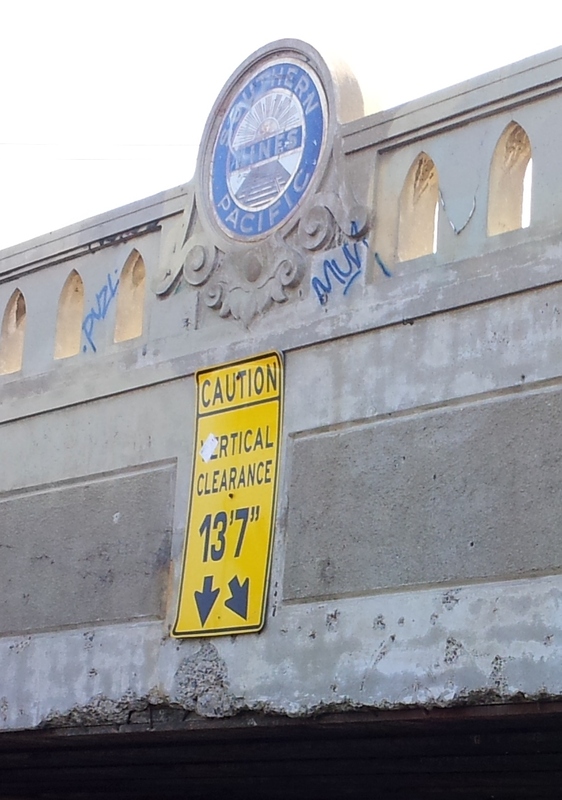 It may have been cleaned once, but soon re-graffiti appeared, and on the east side rail also. The High Speed Rail construction is progressing and it is interesting that it has a beginning locally at the Madera County, Avenue 12 location of Southern Pacific Railroad’s Borden Station. There is a history there, which is going to have to be a different posting. I am not a particularly crazy-about-railroad type of guy, but I do have a nostalgic thing for a past time, and the past images. There was another thing about how I felt about the Union Railroad taking over the Southern Pacific. But, that is another issue too, and another piece later. This entry was posted in Uncategorized and tagged Art, author, California, commerce, editor, government, history, inspiration, politics, problems, railroad, regional topics, theories by timdesmondblog. Bookmark the permalink.